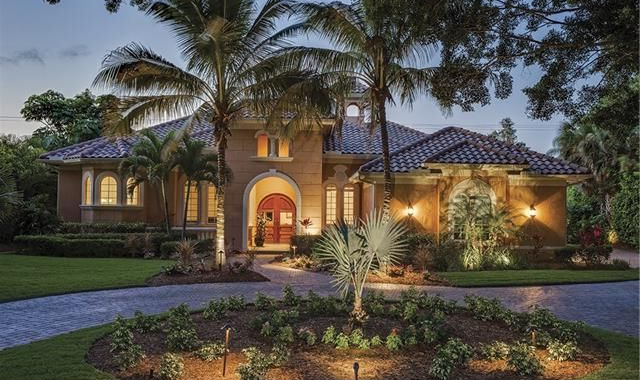 The Moorings is undoubtedly one of the most prestigious communities in all of Naples. Aside from the natural beauty of Southwest Florida that attracts new residents, the Moorings is in a prime location to enjoy the best of the best. The community covers more than 800 acres of land plus waterways with direct access to the Gulf of Mexico and a mile-and-a-half of Naples’ finest white sand beaches as its western boundary. The Moorings eastern edge touches Tamiami Trail (US 41). It stretches from Binnacle Drive on the north to about a quarter-mile south of Golden Gate Parkway. The Moorings Homes For Sale - Updated Daily! Waterfront single-family homes are rarely available because of their highly desirable location. These homes are located in the Vista Royale and Fairway Terrace neighborhoods. Homes range in size from 3,200 square feet to more than 5,000 square feet and usually sell for $1 million or more. In addition to approximately 875 single-family homes, the Moorings includes 82 condominium neighborhoods with just about every name from A to Z, beginning with Admiralty Point all the way to Yacht Harbor Manor. Following is a sampling of Moorings neighborhoods. Admiralty Point is a resort-style, gated and guarded neighborhood with 144 condos in two buildings, one on the Gulf, the other on the Bay. Residents enjoy two large, heated pools and Har-Tru tennis courts. Yacht Harbor Manor is a Co-Op neighborhood of 24 condos distributed among six two-story buildings. Floor plans range from 900 to 1,200 square feet. St. Croix Club neighborhood has three seven-story buildings right on the beach, housing a total 36 units, with only two residences per floor. Floor plans from 1,500 to 1,750 square feet include open-air, screened terraces with direct views of the Gulf of Mexico and its spectacular sunsets. Regency Towers is a neighborhood of luxury residences with 1,942 to more than 3,000 square feet of living. Typical floor plans feature two or three bedrooms with an equal number of bathrooms. There are only two units per floor. The Imperial Club neighborhood has 41 residences in a single eight-story building on the beach. Homes range in size from 1,400 to 3,000 square feet. A guest suite is available for visitors. Residents relax in a beautiful beachfront pool. Commodore Club is a Bayfront mid-rise neighborhood with a beautiful courtyard entrance on the south side of Harbour Drive, immediately east to the Harbour Drive Bridge. The neighborhood is comprised of five buildings with a total of 82 residences. Boat slips up to 40-feet long are available for lease. Lausanne is a prime example of the condo lifestyle in the Moorings and in Naples. Residents of the two nine-floor towers are just 75 feet from the beach. The crystal clear pool sits between the two building is surrounded by a 30,000 square-foot deck. The 90 residences in each building are available in two, three, and four-bedroom plans ranging in size from 1,500 to over 3,300 square feet of living space. These are just a few examples of the 82 neighborhoods available in the Moorings. But the Moorings is about more than the buildings. The 18-hole, member-owned Moorings Country Club, located near the center of the community, is the only private golf course in the city of Naples that is west of Tamiami Trail. Plus, Moorings boasts the most direct-access, waterfront shoreline in the city. Membership in the Moorings Country Club are available, but not required. Several different levels of membership are available ranging from Annual Dining to Full Membership with equity. The club even offers a special membership level for residents of continuing-care retirement communities. The course is player-friendly and designed for the typical skill set of recent retirees. Golfers are not required to use carts. The Sunday Champagne Brunch Buffet at the clubhouse is considered by many as the very best in Naples. Lunch and dinner are served daily under the watchful care of the club’s award-winning chef. A peek at the dinner menu reveals creations such as Lamb T-bone Oscar or Asian Seared Ahi Tuna Salad. Although Naples is known for fine dining, there is no need to leave The Moorings to find it. Speaking of fine dining, Naples arguably offers the widest array of multicultural cuisine west of Miami and in all of Southwest Florida, from traditional America to Cuban, European, and Peruvian, there is something new for even the most refined palette to savor. If “location, location, location” is what makes real estate prime, it is hard to beat the Moorings. Naples High School and the trendy Coastland Center are located just on the other side of US 41. Coastland Center is home to Macy’s, Brookstone, Sears, JC Penney, and Dillard’s. Other stores in the Center include Old Navy, Gymboree, Aeropostale, American Eagle, Abercrombie & Fitch, Charlotte Russe, Hollister, and Victoria’s Secret. The Naples Area Chamber of Commerce is also just the other side of Tamiami Trail. There are numerous places of worship around the immediate area of the Moorings, including Emmanuel Lutheran Church, St. Peters Catholic Church, and the Chabad Jewish Center of Naples. A word of caution may be in order: Frank’s Barber Shop and Jimmy P’s Butcher Shop & Deli are adjacent to each other just outside of the Moorings. Be sure you know where you are when you ask for “just a little off the top.” Service stations, grocery stores, and pharmacies are all available within minutes. With its prime location, The Moorings is Naples, for Naples would not be Naples without The Moorings.